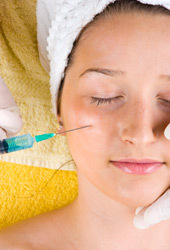 Botox treatment is a revolutionary approach to reversing the effects of facial wrinkles. Crow’s feet, worry lines, and laugh lines can all be a thing of the past. These are referred to as dynamic wrinkle lines and all are treatable with this procedure. Cosmetic denervation is the process of injecting botox into the tiny facial muscles that create the wrinkles. Start your journey towards creating the new You!